iPhone killer or style over substance? LG's new Secret - iPhone killer? Or style over substance? 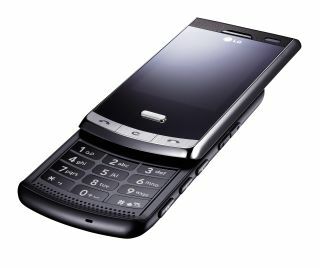 LG has just announced its new phone, the LG Secret, the third model in the LG Black Label Series, following the popular LG Chocolate and LG Shine models. TechRadar was treated to the dry-ice heavy LG Secret launch at London’s Landmark hotel this morning. There, an array of senior execs from LG’s European and Korean offices were on hand to present the fashionista’s new mobile phone of choice and to remind us that 25million phone users worldwide now own an LG Chocolate or Shine phone. Feature-wise, LG is clearly looking to build on the success of it's 'Viewty' range in promoting the 3G Secret as the slimmest 5-megapixel cameraphone on the market. Looks-wise, the LG Secret’s real USP is its sleek aesthetic and the innovative use of carbon fibre and tempered glass which provides "durability without compromising its sleek design". Indeed, LG informs us that the Secret has been "developed to satisfy the refined tastes of trendsetters who desire a sophisticated design with an enduring elegance". LG claims that it has attacked the phone with chisels and knives and has still failed to scratch it. We’ll be sure to give it the same harsh damage testing when we get hold of our review unit in May! The real question of course is whether the LG Secret can compete with the new 3G iPhone when Apple launches that product later this summer. While TechRadar remains on the fence until we’ve given the LG Secret a good run for its money next month, it’s clear that the 5-megapixel camera, 120fps video and DivX certified recording and playback will be features that many users will value over the iPhone’s rather limited photo and video features. LG has developed its Viewty cameraphone tech and the LG Secret’s camera features, Morphing (facial editing) and SmartLight technology as well as Movie Maker software to help users create their own music videos on the go. The Secret’s touchscreen gives direct access to music, photos, games, documents and an FM radio. One particularly cool feature LG was keen to show off is the ability to flick through your photos on the screen while listening to music. The accelerometer-controlled games on show left a little to be desired, with very basic versions of baseball and fishing games failing to set the world alight. Athough it will be interesting to see if the bigger third-party mobile gaming developers and publishers embrace the LG Secret in the same way that they are currently embracing Apple’s iPhone, which features similar motion control for gaming. Work-wise, you can access mobile versions of Word, Excel and PowerPoint files and access the internet via Google Package. This lets you log into Gmail, use Google Maps and watch YouTube videos. "The huge success of the previous models of the Black Label Series validated our approach to provide the ultimate mobile experience for today’s discerning consumers, who seek to embody personal style with their handsets," says Skott Ahn, president & CEO of LG Electronics Mobile Communications Company. "These are the enriched features that will diversify the way users interact with their handsets but most of all, the LG Secret was designed to be a style that lasts." Expect to see that 'Style That Lasts' strap splashed across buses, cabs, TV and print ads in the very near future. So is this LG's 'iPhone killer'? Or is it, as some cynics at today's launch sniped 'mere style over substance'? Only time will tell. For the full low down you can check out the (Flash-heavy) LG Secret Global Microsite.